U.S. Secretary of State John Kerry said Wednesday that NATO members stood ready to step up military efforts against the Islamic State and held out hope of broadening cooperation between the West and Russia to end Syria’s protracted civil war. After two days of meetings at NATO’s headquarters in Brussels, Kerry said several alliance members were bringing more to the battle or would do soon. He didn’t outline any fresh commitments specifically, saying plans would be announced only after foreign ministers first consult their governments at home. These steps would come on top of Germany’s recent approval for sending forces and materiel for a non-combat support role near the Middle East, and a British vote Wednesday that could authorize expanded airstrikes by that country against IS in Syria. Kerry said he called on each of the other 27 members of alliance to do more to strike at the extremist group’s core in Iraq and Syria and strangle its international networks. He said U.S. partners in the region, including NATO member Turkey, should receive defensive assistance. Kerry said military assistance wouldn’t mean ground troops or direct fighting for some countries. The effort to expand operations, which has gained steam since last month’s attack in Paris, will require more medical facilities, intelligence gathering, military support structure, refueling operation, greater aerial defenses and other action, he said. 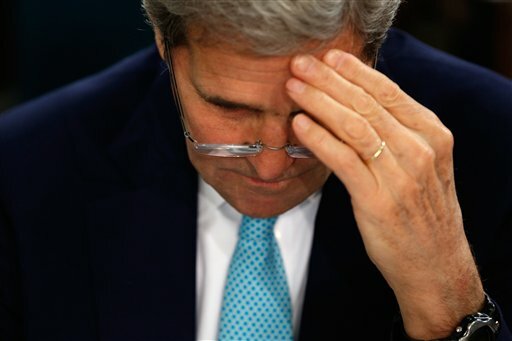 “There are a number of things countries can do,” Kerry told reporters. On Tuesday, U.S. Defense Secretary Ash Carter told Congress that the American military will deploy a new special operations force to Iraq to step up the fight against IS militants who hold territory there and in Syria. President Barack Obama previously announced he was sending fewer than 50 special operations forces to Syria. Kerry repeated Obama’s argument from a day ago that no peace in Syria would be possible while its president, Bashar Assad, remained in power. But he said an international mediation effort that now includes Assad’s backers — Russia and Iran — recognizes the need to maintain the Syrian state and key services such as health and education. Seeing those dismantled, as happened after the U.S. invasion of Iraq in 2003, would be “disastrous,” Kerry said. He added that Russia and Iran continue to have a different view on Assad. But Kerry also said that Russia, if its focus on fighting IS is “genuine,” could have a constructive effect in bringing peace. He didn’t address whether the U.S. might be willing to bring Russia into its military effort against IS, as some members such as France have been proposing.